Nissan's smallest crossover SUV still looks like nothing else on the road with style you'll love or hate, and it prioritizes sporty performance over passenger- and cargo-carrying utility. The 2016 Nissan Juke offers a lot of fun for around $21,000, and is even available in souped-up Nismo RS form that packs 215 horsepower. 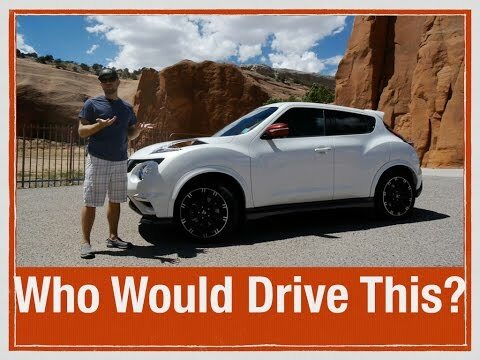 I love my juke, however the ride is rougher than I had initially expected, especially on country routes, but I enjoy the feel of the turbocharged engine and athletic handling on the highway. The interior quality is low, though that is not my main interest in a vehicle. The fuel costs are also higher than my previous vehicles, due to it requiring premium fuel. Overall, the juke fits my needs and I have very few issues with performance or reliability. Great car but there are no vents in the back seat. I had researched compact SUVs prior to making the visit to the dealer and the first one that caught my eye was the juke. The juke is compact but has enough space for everything that I need. I currently don't use it to haul any children but I think that it would do just fine as a family car having two kids in the back although there are not any ac or heat vents in the back seat. I also love that the car has the option to switch between 2wd and AWD. The Nissan Juke is a fantastic vehicle for a two people. The backseat is relatively small, but the seats can fold down for more optimal storage space. I used it to travel across the country and its speed, performance, and gas mileage were great. After an additional 3000 miles, the only maintenance it needed was an oil change. The Juke handles well, and is lightweight and sporty in maneuverability.